One of the many symptoms of the human overpopulation crisis is that we are facing serious energy limitations. People need to understand more about energy. Most people seem to think that we just need more, more, more. Our voracious and insatiable appetite for energy is doing us in. Actually, we will have to learn to live more frugally using much less energy. According to Einstein's theory of relativity (E = mc2), mass is just highly condensed energy. This is why turning matter into energy via an atomic bomb or a nuclear power plant yields so much energy (Fission versus Fusion). From this perspective, we have access to almost unlimited energy (but see Dittmar (2011) "The Future of Nuclear Energy: Facts and Fiction". 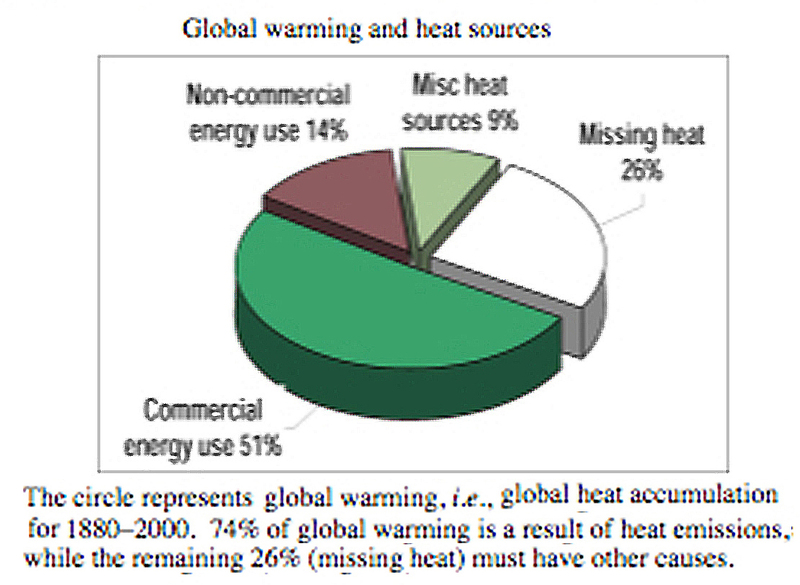 Yet, it is perilous for us to use more energy because the resulting waste heat cannot be dissipated (Hansen et al. 2005) (see also this Link). Physics and chemistry have given us two basic laws of thermodynamics that must be obeyed by all forms of matter and energy, including living organisms. Despite our cleverness and power, humans are not exempt from these physical laws. The first law of thermodynamics is conservation of matter and energy: matter and energy cannot be created or destroyed, but as explained above, they may be transformed. Perpetual motion machines are impossible. The second law is that energy disperses (entropy always increases). Over time, randomness increases as matter and energy disperse. Ruddiman has proposed that human activities, primarily deforestation, began to alter atmospheric carbon dioxide and methane levels many centuries ago, long before the industrial revolution. If so, global warming may not be a recent development but may have begun nearly 100 centuries ago with the advent of agriculture. The figure at the left shows how rapid deforestation was in the United States. The figure below shows Nordell and Gervet's (2009) estimates of how much anthropogenic heat emissions have contributed to present day global warming. Fossil fuels (coal, oil, and natural gas) were formed hundreds of millions of years ago by primary producers long before there were any people. During the last century, humans have burned up vast amounts of these limited supplies of fossilized sunlight. We must stop squandering Earth's non-renewable resources because burning fossil fuels releases carbon dioxide into the atmosphere which in turn increases its heat-holding greenhouse effect and leads to global warming. Like CO2, the natural gas methane CH4 is a greenhouse gas. One molecule of methane is equivalent to about 20-25 molecules of carbon dioxide in terms of its effects on global warming. When a molecule of methane burns, it gives off heat energy as it is oxidized into 2 molecules of water and one of carbon dioxide, both of which are powerful greenhouse gases. 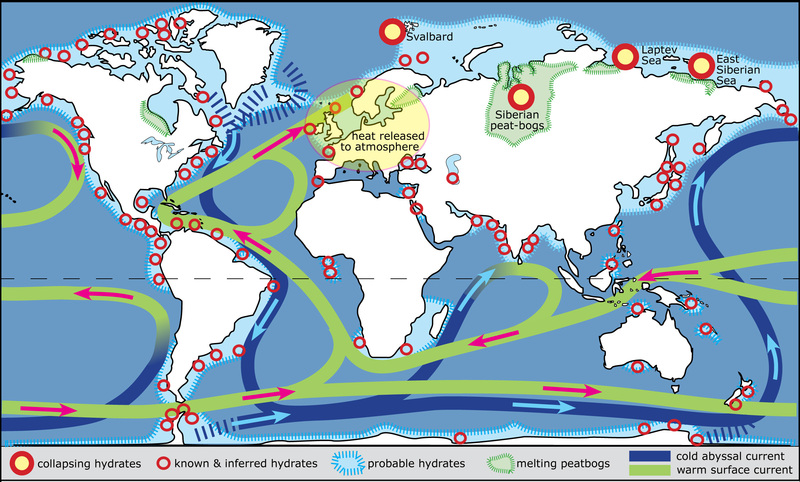 Long frozen fossil methane is being released from thawing permafrost and from clathrates in the deep oceans at an ever accelerating rate. As temperatures rise, more methane bubbles up to the surface, further raising temperatures in an ever increasing positive feedback loop. Is there a critical "tipping point" at which the state of Earth's surface will change drastically, and if, so, what is it and when will it be reached? Some experts think this tipping point has already been crossed. Major methane vents are shown on the following map. Methane levels in the atmosphere are now more than double the levels that they have been over the last half million years. This could well portend the onset of a powerful positive feedback loop that will almost certainly lead to very rapid global warming. We should be doing everything we can to KEEP the methane frozen in the deep oceans, however, fools that we humans are, we are planning to deliberately extract it and BURN it releasing a lot of waste heat that cannot be dissipated as well as adding more water vapor and carbon dioxide to the atmosphere, further enhancing global warming. An international consortium involving Canada, the US, Japan, India, and Germany is already extracting methane from frozen methane clathrates and burning deep sea methane off the north coast of Canada at a place called Mallik. Moreover, fossil fuels are a finite resource and we are rapidly running out of them. As human populations burgeon and economies grow, demand for limited supplies has driven up the price of oil. An important facet is energy return on investment (EROI). In the 1930s, oil gushed out of wells and EROI was around 100:1 (blue circle at top left in the following graph). By 1970, EROI had dropped to about 30:1, but today domestic oil must be pumped out from depths at considerable cost (red ellipse near the bottom of the graph, EROI has fallen to about 10:1). Total energy consumption by the USA in 2005 is shown with the red ellipse at the far right which illustrates our extreme dependence on imported foreign oil. A minimum EROI above one is necessary for civilization to endure (horizontal dashed line). Two examples of energy sources that fall below this EROI line are shown: gasohol and tar sands. More energy is actually required to produce a gallon of ethanol than is returned when it is burned! Prohibitively huge amounts of energy will be needed to extract fossil fuel from Canadian tar sands. Although some fools delude themselves into thinking that oil replenishes itself deep in the Earth, it does not. Because fossil fuels are portable and very concentrated sources of energy, easily stored and transported, humans have unfortunately become very dependent upon them. One gallon of gasoline will move a one ton car 50 miles in just an hour -- imagine how many people and how much time it would take to push that car that distance! Other energy sources, such as sun and wind are not nearly as versatile. Some pseudo-scientists under the payroll of big oil assert that oil and natural gas supplies are adequate to get us through to the end of 2100, but no one knows how long dwindling supplies will last in the face of rapidly increasing world wide demand. Vast reserves of coal exist, but so-called "clean coal" is an oxymoron. Burning coal produces large amounts of pollutants and greenhouse gases. The future impact of global warming is coming up on us very fast. Burning of fossil fuels has released large amounts of carbon dioxide levels into Earth's atmosphere. By reflecting heat back to the planet that would otherwise radiate out into space, greenhouse gases such as carbon dioxide and methane have warmed the Earth's land surface and oceans (see global warming). We must stop adding greenhouse gases and waste heat to the atmosphere if we are to slow global warming. Americans have suffered from painful increases in the cost of gasoline at the pumps. People are clamouring for alternative new sources of energy. Many are ignorant of the laws of thermodynamics, which must be obeyed. Using energy in any form always produces waste heat, and unless it can be dissipated, temperatures will rise. Earth can no longer dissipate the heat it receives from normal incident solar radiation fast enough to stay in balance (Hansen et al. 2005), even without our adding insult to injury by burning fossil fuels and using nuclear reactors. Because people have electrical outlets all over their houses and offices, they suffer from the illusion that electricity is clean energy, infinite in supply and will always be there. None of these assumptions is true -- unless we convert to an electrical system based on renewable resources such as solar energy, power grids must ultimately fail and the internet will cease to be. Whenever you turn on a light or an air conditioner, chances are that coal or methane is being burned to generate the electricity you're using. A relatively small amount of electricity is generated by other sources such as by wind, hydro-electric, and/or solar energy. When you turn on a light, you are usually releasing solar energy captured by plants millions of years ago -- essentially, you are being illuminated by fossil sunlight that fell on the Earth long ago before humans even existed. Unfortunately, electricity is difficult to store and usually must be used immediately. Battery technology to improve our ability to store electric energy has been painfully slow. Al Gore's bold new goal of converting to a solar-powered electrical energy system would greatly reduce carbon emissions from the burning of non-renewable fossil fuels. Switching over to renewable sources of energy (wind and sun) would also make our electrical grid system more stable and reliable in the future (download Helmut Burkhardt's essay on energy technology). However, switching over to renewable energy is not nearly as simple and easy as many people might hope ( Renewable Energy: The Vision And A Dose Of Reality). Even if all humans stopped burning fossil fuels entirely right now, the planet will continue to warm for some decades. Earth simply cannot support all 7+ billion of us, certainly not in the energy-consuming style in which we'd like to live. Politicians are quick to promise energy solutions, but always by the year 2020 or 2050, too far into the future to alleviate pressing present problems. Moreover, they ignore the underlying causal problem: too many people. To keep spirits up, politicians and corporations invent and exploit expressions like “sustainable growth” and “sustainable development.” People do not analyze these expressions, but prefer blissful ignorance vis-a-vis their meaning. However, stringing such antonyms together merely creates irresponsible oxymorons. Most people remain in a state of denial, impervious and oblivious to the impending crisis. Of course, humans are clever, so clever that we have actually figured out how to turn matter into energy by exploiting fission and fusion. 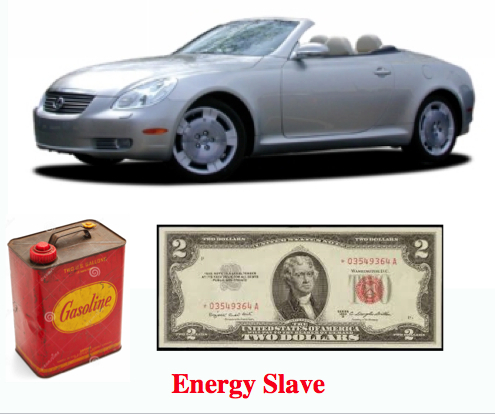 Many people think that an unlimited supply of energy is therefore available. Nuclear energy may be virtually limitless, but it carries serious environmental hazards (particularly thermal pollution and radioactive waste). A few engineers see infinite energy prospects in beaming more solar energy from outer space to the planet’s surface. A Japanese company is actually proposing to capture solar energy on the moon and transmit it to Earth. People just don't get it! Access to unlimited energy would lead to our downfall (see below). Unlimited cheap clean energy, such as that so ardently hoped for in the concept of cold fusion, would actually be one of the worst things that could possibly befall humanity. Such energy would enable well meaning but uninformed massive energy consumption and habitat destruction (i.e., mountains would be leveled and terraced, massive water canals would be dug, ocean water distilled, water would be pumped and deserts turned into green fields of crops). Human populations would grow even higher until the last vestiges of natural habitats are all destroyed. Heat dissipation would of course set limits, for when more heat is produced than can be dissipated, the resulting thermal pollution will quickly warm Earth's surface to the point that all life is threatened, perhaps the ultimate ecocatastrophe. Even if humans were not adding vast amounts of excess heat by burning non-renewable fossil fuels and running nuclear reactors, Earth can no longer dissipate the heat it receives from normal incident solar radiation fast enough to stay in balance ( Hansen et al. 2005). Global warming is happening faster than anticipated and the current goal of limiting global temperature rise to 2° C by 2030 will require limiting carbon dioxide emissions. Recent analyses have shown that, in order to meet this goal, massive amounts of known and predicted fossil fuels must remain unused (McGlade and Ekins 2013). If we cannot find the willpower needed not to burn these reserves, global temperatures will continue to soar well past the 2° C limit, long frozen ice will continue to melt, sea levels will rise dramatically, innudating low lying islands and coastal cities (Oreskes and Conway 2014). Our economic system based on continual growth must be replaced by a sustainable system where each of us leaves the planet in the same condition that it was in before we were born. This will require many fewer of us and much less extravagant lifestyles. We won't be able to move around so freely (airplanes will become a thing of the past) and we will have to go back to walking and riding bicycles and horses. In addition, humans will have to be more spread out, living without big cities. Before it is all over, if humans are to survive, we are going to have to live much more frugally, limit our own reproduction, control human greed, un-invent money, revert back to trade and barter, and grow our own crops, among other things. Bottom line: Burning fossil fuels of any sort, and using energy in any way even via nuclear reactors only adds insult to injury because such activities produce waste heat that cannot be dissipated. Hence we are actually speeding up the rate of global warming by all our efforts to find and use more energy, fracking included (see also fracking). Our steadfast refusal to live by the rules of thermodynamics is rapidly shortening the time left for all life on planet Earth, our one and only spaceship. There is simply no such thing as "clean energy." Delaney's "What to do in a failing civilization"